WASHINGTON (CNS) — Statements on preaching and ways that bishops can respond using new technologies to modern-day challenges to their teaching authority are among the items the U.S. bishops will consider when they gather in Baltimore for their annual fall assembly. Set for Nov. 12-15, the assembly also will consider a statement on work and the economy proposed by the Committee on Domestic Justice and Human Development as a way to raise the profile of growing poverty and the struggles that unemployed people are experiencing. The document on preaching that the bishops are to consider encourages preachers to connect the Sunday homily with people’s daily lives. Titled “Preaching the Mystery of Faith: The Sunday Homily,” the document is the bishops’ first substantive statement on preaching in 30 years, said Archbishop Robert J. Carlson of St. Louis, chairman of the bishops’ Committee on Clergy, Consecrated Life and Vocations. The intent to address preaching first surfaced among the bishops six years ago, but drafting it took place over the past year and a half, Archbishop Carlson said. The bishops also will consider a proposed statement on opportunities to use new media — including blogging and social media — in exercising their teaching authority. The statement drafted by the Committee on Doctrine, “Contemporary Challenges for the Exercise of the Teaching Ministry of the Diocesan Bishop,” has been distributed to the bishops and suggested amendments are being received, said Capuchin Franciscan Father Thomas G. Weinandy, executive director of the bishops’ Secretariat for Doctrine. The text, like all of the proposed documents the bishops will consider, has not been made public. The statement complements a 1989 document on the doctrinal responsibilities of local bishops that sets forth guidelines for a bishop to follow when responding to comments, statements, books or other communication from a theologian that incorrectly portrays Catholic teaching, Father Weinandy told Catholic News Service. “Given the situation and the speed and breadth in which (a theologian’s view) could be circulated, the bishops on the doctrine committee felt it would be good to encourage, in some circumstances, (ways) to put up more quickly a response to these situations,” Father Weinandy explained. An immediate response from a bishop would be followed up with the normal invitation to dialogue with the theologian, he said. The statement on work and the economy, titled “Catholic Reflections on Work, Poverty and a Broken Economy,” is expected to advance the bishops’ priority of human life and dignity to demonstrate the new evangelization in action, Bishop Stephen E. Blaire of Stockton, Calif., chairman of the Committee on Domestic Justice and Human Development, explained during the bishops’ June meeting in Atlanta. The bishops will devote time to discuss whether to revise the norms governing fundraising as covered by Canon 1262 in church law. The discussion is expected to focus on the need to clarify when a bishop would have to approve any appeal to raise funds based on from where the fundraising appeal originated. Existing norms on fundraising were approved unanimously by the bishops in 2002 and received approval from the Vatican, or “recognitio,” in 2007. A proposal to establish a new national collection for the U.S. Archdiocese for the Military Services will be weighed by the bishops. Under the proposal from Archbishop Charles J. Chaput of Philadelphia and Archbishop Timothy P. Broglio of the military archdiocese, the collection would be taken up every three years. The U.S. Archdiocese for the Military Services provides pastoral ministries and spiritual services to those in the U.S. armed forces. The archdiocese serves 1.8 million men, women and children in more than 220 installations in 29 countries, patients in 153 Veterans Affairs Medical Centers, and federal employees serving outside the boundaries of the United States in 134 countries. Liturgical matters also are scheduled to come before the bishops. In regional meetings, bishops are expected to spend 30 minutes evaluating the implementation of the third edition of the Roman Missal, which was introduced at the start of liturgical year last November. The comments were being solicited by the Committee on Divine Worship to assist in preparing translations of other liturgical books and plans for their implementation. In addition, the bishops will vote on a proposed “scope of work” for revision of the Liturgy of the Hours submitted by the Committee on Divine Worship. The committee’s request comes as the International Commission on English in the Liturgy has started work on revising some parts of the liturgy, specifically hymns, some orations and some antiphons. The bishops also will vote on a new treasurer and chairmen of five committees. 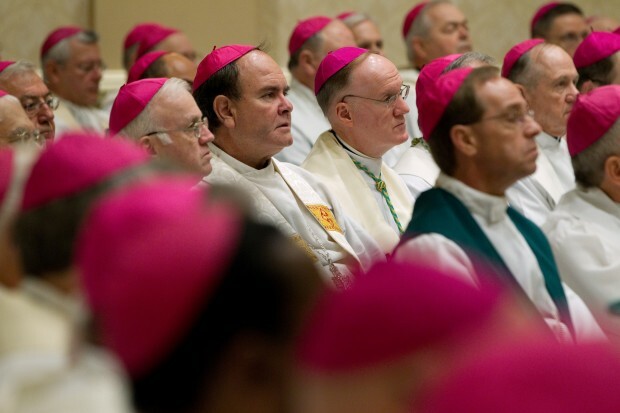 Those elected will begin three-year terms during the bishops’ 2013 fall general assembly. The bishops will choose a new treasurer; the two candidates are Bishop Robert J. Cunningham of Syracuse, N.Y. and Bishop Kevin J. Farrell of Dallas. The treasurer serves as chairman of the Committee on Budget and Finance. New chairmen of the committees on Consecrated Life and Vocations, Divine Worship, Domestic Justice and Human Development, Laity, Marriage, Family Life and Youth, and Migration also will be chosen. Members of the boards of the Catholic Legal and Immigration Network, Inc. and Catholic Relief Services also will be elected. Also under consideration will be proposals to add one staff member in the National Religious Retirement Office and another to serve the Subcommittee on Native American Affairs under the Secretariat for Cultural Diversity in the Church. The bishops plan to view a Spanish-language video on the promotion and defense of marriage between one man and one woman.